Ico begins the story of a young boy imprisoned in a castle as the horns on his head are considered to be cursed, and so soon after he escapes from his cell he must look for a way out of the castle, which seems to be an impossible labyrinth at first. Not long after leaving the first hall, Ico bumps into Yorda and decides to help her escape the castle as well, which serves his quest even better as she can open ancient doors using her mysteriously acquired magical powers. There are only a few lines of dialogue between the two throughout their first adventure, explained by the fact that Yorda cannot understand or speak the common tongue, even though you will later unlock an option that allows you to understand what she says in your second playthrough, but even with that option turned on, it seems unlikely that two characters, both trapped in a cursed castle would only interact with each other when they need to reach higher ground and need a boost. Those lines don't make much sense either and all the events that occur in the first one hour and a half of the game seem pointless, because all those moments are nothing more than a huge build up for the ending, which from a story perspective could have been told 10 minutes after the game started. Even though mystery is an essential part of Ico's story, there is no documentation or information on the characters whatsoever, leaving you with more than a few questions even after you have finished the game and understood what Yorda was saying. Shadow of the Colossus serves as a spiritual successor to Ico, however it is not related directly to it, as the game follows another young boy named Wander as he travels to an ancient monastery, the home of an entity called Dormin who is Wander's only chance to save Mono, a girl who has been put into permanent sleep, and so Wander and the entity have reached common ground and the hero must go on a quest to defeat 16 different Colossi that rule the lands and in exchange Mono's life will be saved. Just like Ico, Shadow of the Colossus's story is all about the ending and reaching that moment, and even though it's disappointing how only minor things happen between between each fight, only giving you a short background story about each colossus and sending you on your way to defeat him, but this time around it feels like you actually have a clear purpose and even though the 2-3 hours in the middle of the game are boring from a narrative point of view as nothing worthwhile happens at all, once you reach the final colossus you will already be anxious to see the conclusion. As this game is much more open world oriented, you can travel freely using your horse Argo and engage in different activities that are mostly based on collecting things that will increase your stamina or health bar, but even if those are a welcome addition, the world still feels empty once you are no longer focused on killing the colossi. If for some reason you missed the early 2000's glitchy and repetitive gameplay mechanics, dumb AI and losing game progress because the last save point was 15 minutes ago look no further, because Ico brings all those back without a single improvement. It's not only the age of the game that makes the gameplay frustrating today, those mechanics were bad to begin with, but replaying the game a decade after, it seems ten times worse. There are few things you can actually enjoy while playing Ico and those are not enough to justify all the frustrating mechanics that were left untouched for whoever knows what reason; starting with the fact that the puzzles are repetitive and the fact that if you haven't played the original game you will probably need either a lot of time or consulting a walkthrough to find your way to the next objective since there is no marker or guide to tell you where you should head next or what you have to do, so as a new player you will probably spend more time finding out what exactly you must do rather than actually doing it. To top all that off, you still have the glitchy AI that was common a decade ago, the direction oriented jump mechanic that will lead to your death at least a few times and probably the most annoying at all, fixed saved points that will only show up every 15-20 minutes, depending on how fast you move to the next room and combined with the inevitable deaths this can lead to some serious frustration. Unlike Ico, Shadow of the Colossus is a much larger, open world adventure and even though there isn't much to do outside the main story, going in the wrong direction isn't necessarily a problem as you will often run into a tree where you can boost your HP or lizards that will boost your stamina, and even if you do get lost you can use your sword to point you in the right direction. The main objective however is to defeat each one of the 16 colossi and for that you must first find the one the entity pointed you to and find the way to defeat him. The battle mechanics are simple, each one of the colossi has a weak spot, marked with a shining insignia and your job is to find a way to reach that spot and once you are there time your attacks well enough to defeat your enemy before running out of stamina and falling off. Some battles are more interesting than others, in fact there are a few battles that are challenging in an entertaining way, but at the same time others will require you to climb on the respective colossus only to get thrown off after dealing the first hit and having to climb all the way up again, which can be pretty annoying and boring. As great the idea of climbing the colossi and doing all sorts of stunts to reach their weak spots, as disappointing it is to find out that each colossus has only one way up and instead of letting you improvise and find your own way up you'll have to move around it for a few minutes just to figure out which way was intended to be the climbable one. Visually, both games look amazing in HD and the unique art that made those games memorable in the first place is still intact , with a few improvements and changes here and there. 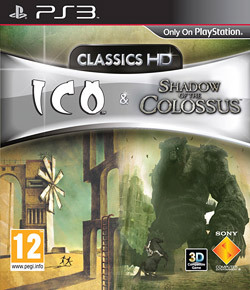 Neither Ico nor Shadow serve as simple upscaled ports of the original games on the PlayStation 3, as both games have things that have been redone or at least upgraded visually in a way or another, such as the Colossi which are simply astonishing to look at, but at the same time some other environmental objects have been left untouched, making the graphical quality feel inconsistent. Nonetheless, the games look beautiful as they are, but there was certainly room for a lot more, as the repetitive design in Ico that was standard for games at the time is an obvious roach among modern titles. The visual effects have been improved, but they still feel outdated compared to other 2011 titles, and even without knowing you can easily determine that this is a port of an older game, but after all there is a limited number of things you can do to improve an older game without having to rebuild it entirely. Audio quality has been improved as well, preparing those classics for the jump to the PlayStation 3 and even though everything sounds great and in place, don't expect anything breathtaking; after all, there are limits on the things you can do with a decade year-old games while still keeping that magic that made them great to begin with. Same as the visuals there was room for a little bit more without destroying the original tone, as high definition effects for things such as the sword swing are just a cover for the inexistent distance volume and missing echo that are standard for games in the modern age. All that aside, among the most memorable things about those games you can mark the soundtrack, which is nothing less than perfect, bringing back those tunes that made the early 2000's of PlayStation so memorable and ignite the flame of nostalgia into anyone who has ever touched one of those games before. Ico is a game that can be finished in less than 2 hours if you know what you're doing, and there's even a trophy to reward you for doing just that, as for Shadow of the Colossus, it shouldn't take longer than 6 hours to beat the main story for the first time, but since this game is oriented more on open world exploration and doing things at your own pace you can spend at least another 4 hours just looking around, exploring and picking up some collectibles on the way; even more, once you beat the game once you will unlock the Time Attack mode, which will challenge you to defeat each one of the colossi within a time limit and reward you with special items for doing so. Shadow of the Colossus is a better game than Ico in every aspect, and even if some of the mechanics can lead to frustration both games are a must try for the fans of the genre, as for those who have already played those games on the PlayStation 2, apart from an upgraded resolution and trophies support there is nothing else to look forward to, those are still the same old games that only look bad compared to today's titles from a gameplay perspective, which is such a disappointment since a few tweaks could've brought those classics to a new generation.